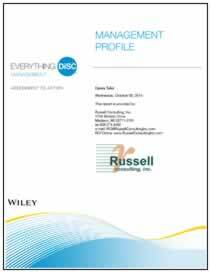 DiSC® – Everything DiSC® Management Profile – Russell Consulting, Inc. The Everything DiSC Management Profile. Everything DiSC Management® is an online profile based upon the DiSC framework that provides a participating manager or supervisor with rich feedback on his or her behavioral profile and it’s impact on the manager’s ability to motivate, delegate, and develop others. Management Profile encourages managers and supervisors to understand their own managerial behaviors and how they impact their effectiveness. Note: Since Everything DiSC Management Profile is delivered to you online, if this is the only thing you are ordering from us, simply ignore the “Please Choose Shipping” when checking out.